BoardGaming.com> Games> Card Games> Bang! Very nice quality cards, tokens and boards (we rarely use tokens and boards, though). Design is pretty nice, colours are light, font is very much in style of western, everything is very clear. I like the design of the game. There are 3 decks of cards. There are Roles, Characters and Action cards. 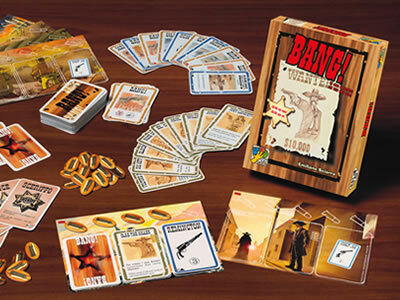 Each player takes a role character in secret (depending on the number of players, there are different numbers of outlaws, deputies and one renegade and sheriff). Each role has a different win condition, so Sheriff and Deputy will win if all outlaws and renegade are dead, Outlaws win when Sheriff is dead, and Renegade must be the last alive with Sheriff and kill him to win the game. Sheriff is the only character that is visible to other players. Every player also draws a character with special abilities and different number of hit points. During a turn, a player draws two action cards and plays any number from his hand (but is normally allowed to play only 1 BANG! card per his turn). There are classic instant action cards and equipment cards that have a lasting effect after they are played. Almost actions are represented by few icons and are very easily understood. It should not be played all the time. It is a nice game for those sessions where there are enough players, and you really need to relax your brains… But if there are too many of those situations, I guess you should get few games for such occasions. Replayability is ok, but not great. Add a Review for "Bang!"